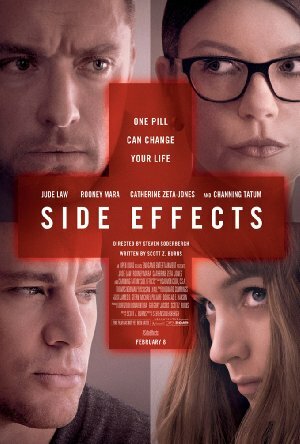 Side Effects is the latest film from director Steven Soderbergh. Jude Law plays a psychiatrist who works shifts at a hospital doing consults, in addition seeing patients in his private practice. He is a partner with two other psychiatrists in a thriving New York City practice. He’s married to a beautiful woman named “Dierdre” (Vinessa Shaw), who has a son. He has a great life until he encounters a patient in the emergency room. “Emily Taylor” (Rooney Mara) was a very happily married woman a little over four years earlier. Her husband “Martin Taylor” (Channing Tatum) was making a lot of money until his arrest and conviction for insider trading. They lost everything and she was forced to move to New York City from their Connecticut home to take a job. She visited him faithfully in prison and was there waiting on the date of his release. Then, without warning something shocking happens that results in Emily being taken to the emergency room. In the ER she meets Dr. Banks, who wants to keep her hospitalized. He thinks she tried to harm herself. She convinces him that this is no longer her intent. Eventually they agree to let her go home as long as she begins seeing him for therapy on a regular basis. He prescribes anti-depressants for her, but she doesn’t do well on any of them. She asks him about Ablixa, a new anti-depressant she’s seen ads for on television. He eventually puts her on the drug after she nearly makes another attempt to kill herself. Seeking answers about how to best help Emily, Dr. Banks contacts the psychiatrist she previously sought treatment from, “Dr. Victoria Siebert” (Catherine Zeta-Jones). She had been forced to stop treating Emily when she lost her health insurance in the wake of her husband’s arrest. Dr. Siebert seems helpful, but the use of the Ablixa is causing Emily to sleepwalk. This is as much of the story that should be told in a review because to detail much more would be to engage in sharing serious spoilers. Suffice it to say that what happens after Dr. Banks prescribes the Ablixa for Emily is a well-crafted story, with a number of surprising twists and turns. The word on the street is that this will be Soderbergh’s last feature film for the foreseeable future, and that’s a shame. He’s a gifted director. But at least he’s leaving on a good note if this is the end. Side Effects isn’t just engaging, it reaches from behind the screen and grabs the viewer securely. High quality directing are combined with a well-written tale and some excellent acting. In particularly, Catherine Zeta-Jones makes the most of her supporting role. Mara was a strong choice to play the depressed wife of Tatum, and when viewed alongside her work in The Girl With the Dragon Tattoo, it shows off her range. As dramatic films go, Side Effects is a cut above.